Grab the camera phones and bucket lists, and let’s shoot the city like there’s no tomorrow. Here’s a slew of my favorite iconic backdrops for photo ops, picture-perfect for your darling social media portraits and status updates, too. Celebrating photographers Robert Doisneau and Robert Capa (who often featured France’s national moments in their haute couture spreads), I’ve meshed the old with the new, fully appreciating the dynamic, overlapping, ever-changing juxtapositions. So with Rolleiflex firmly in hand, let’s snap, crackle, pop. Giddy up! 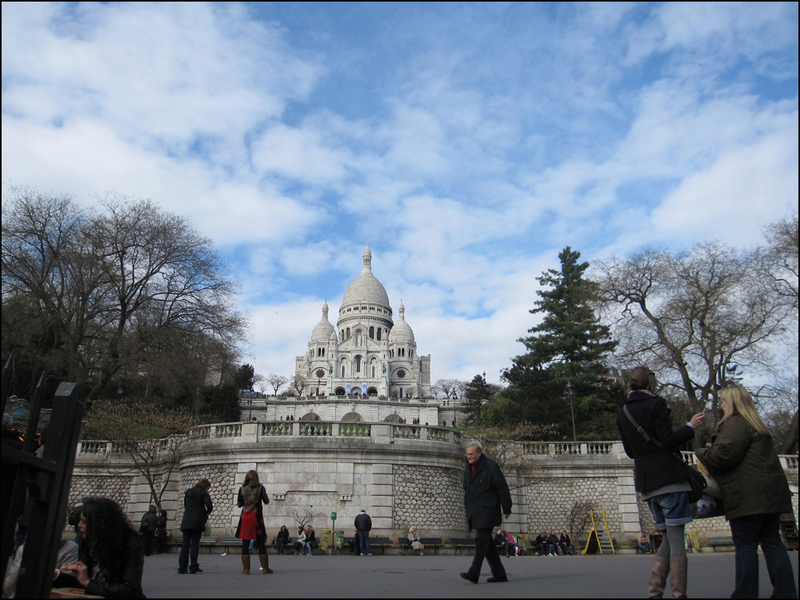 Avoid the crowds by making your entrance at Sacré Coeur early in the morning. Blue skies flatter the iridescent basilica, though she also radiates at twilight. For inspiration, climb Brassaï’s Les Escaliers de Montmartre, nestled next to the funicular on Rue Foyatier. Also, keep your eyes peeled for the pair of “living sculptures.” Wearing white and mimicking Roman statues, they’ll strike a pose with you if you toss a few coins their way. They’re super friendly. When it comes to classic French backdrops, it’s all about the view and location, location, location. 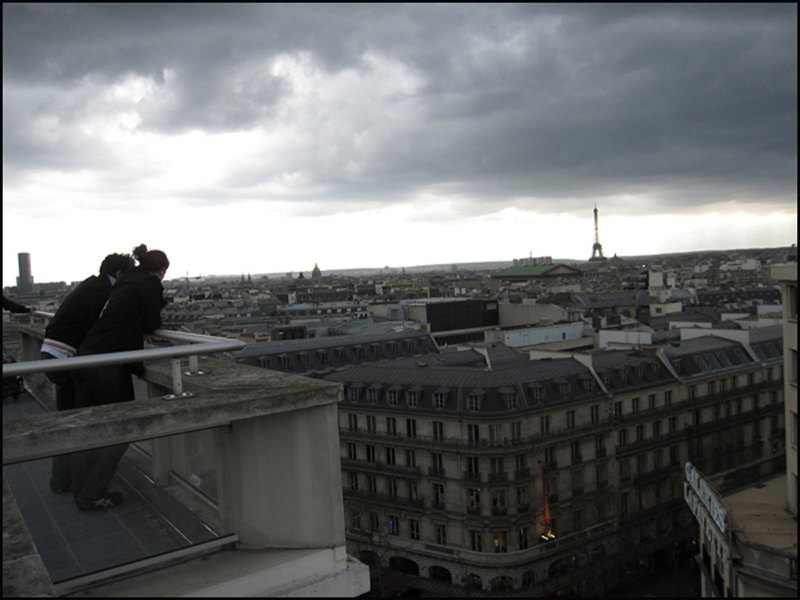 Lucky for all, Galeries Lafayette’s rooftop boasts both. Here you’ll find one of my favorite views of Paris. A triple-threat photo op, so shine on with the Tour Eiffel, the Opéra Garnier, and Sacré Coeur. Tip: Avoid crowds by arriving during the morning or after lunch. Calling all romantics, this one is for you. Here is Paris’s City Hall is where Robert Doisneau staged his legendary photograph, “Le Baiser de l’Hôtel de Ville,” for LIFE magazine in 1950. Here’s the scoop! After spotting Françoise Delbart and Jacques Carteaud smooching, he requested a little replay action for his camera, and the rest was kiss-tory in the making! 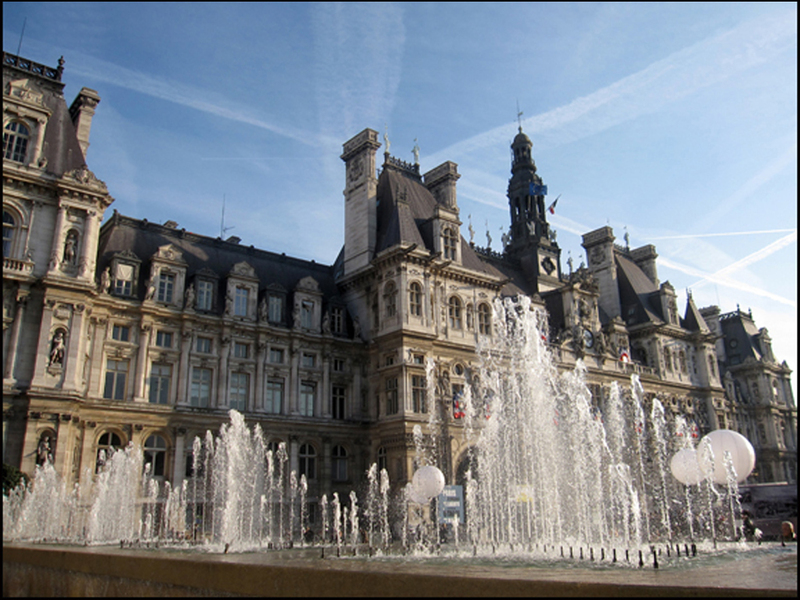 Tip: There are often free exhibitions at the Hôtel de Ville. Also, unlike most museums, this one is usually open on Mondays. And yes, there’s a gift shop, too. Kick-off your photo shoot at the Moulin Rouge around l’heure bleu (twilight). Located in Montmartre, you just might spot the spirit of writer Henry Valentine Miller on the literary prowl. 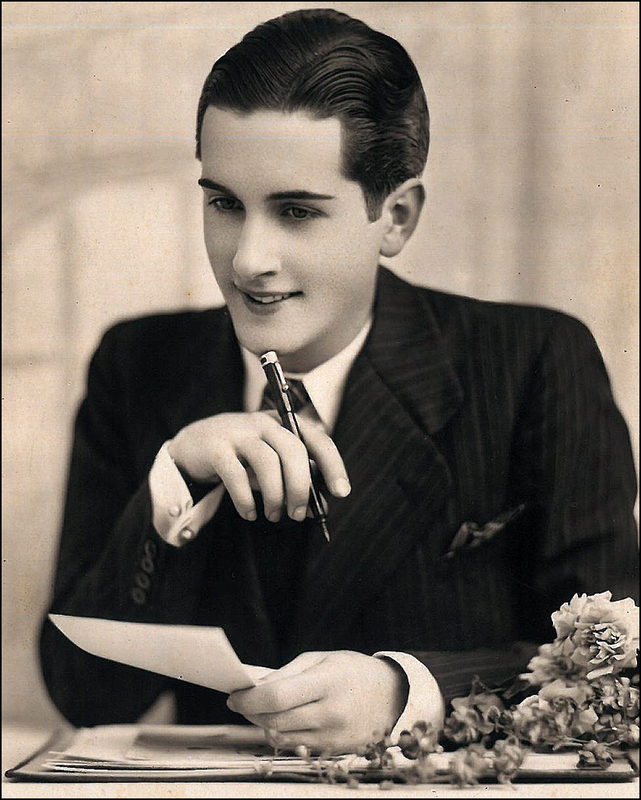 An avid and competitive cyclist, he’d be quite happy with the new bike lanes in Pigalle! Achy Breaky feet at the end of the day? Do like my Moulin Rouge dancer friends do after a long show. Prop your legs up against a door for twenty minutes. Elevation does the trick like no other. I’ve tried it! Now strike a pose, there’s nothing to it! I’ve shopped at Galeries Lafayette but never knew that you could go on the roof. Great tip. Merci beaucoup! OOOOOOOOOHHHHHHHHHHHHH……….your posts make me mad to return to Paris. How beautiful. 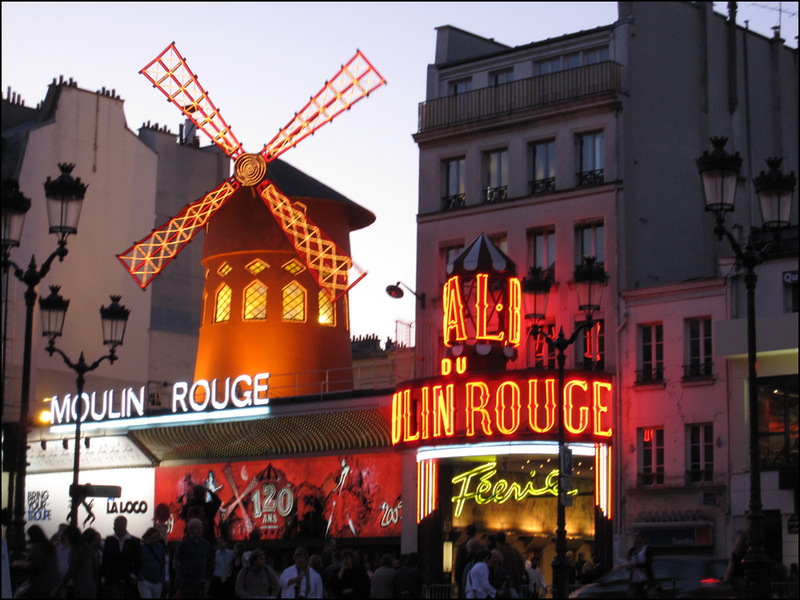 I once stayed in a hotel across from the Moulin Rouge and will never, ever, ever forget that visit. Thank you so much for sharing! Oh, SIGH. Rufus Wainwright’s “La Complainte De La Butte” is such a lovely song. I could listen to it again and again. Music to cry to…..We’re a funny species aren’t we? But sad songs are so much better than happy songs…. I’d couldnt remember MR by Tino Rossi so just found it on youtube.. As soon as I heard the strings at the start it came flooding back..Lovely.. I agree! Edith Piaf and Billie Holiday are always in heavy rotation on my iPod. The Wall Street Journal recently wrote about the very subject: Anatomy of a Tear-Jerker: Why does Adele’s ‘Someone Like You’ make everyone cry? Science has found the formula. NPR also featured a story. Hi Theodora…..Crikey…I dont know if we’re better off for knowing all of that stuff or not??? It’s a bit like finding out how the man in the cape cuts the pretty lady in half…. Just listen to Billie..’Don’t explain’…no need for science…..It’s magic.. 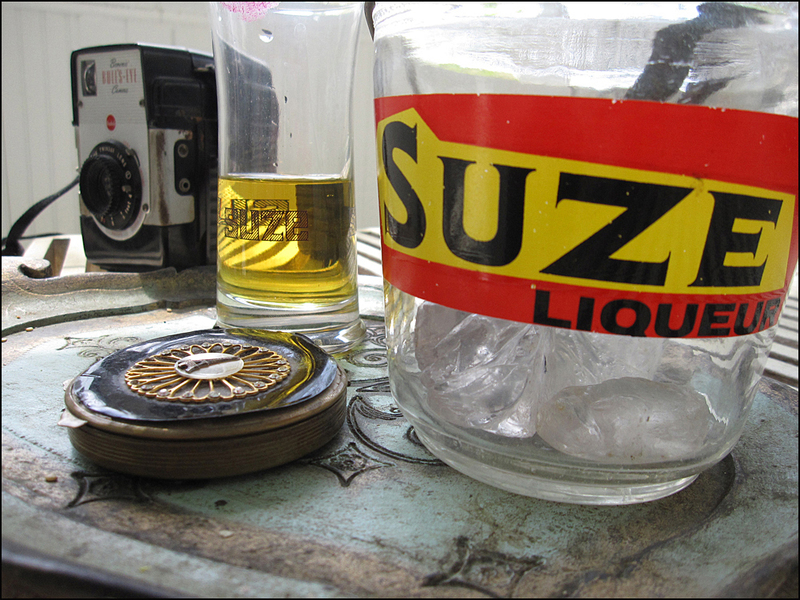 Terrific post – I may be back in Paris in the spring and this gives me lots of photo ideas! i imaging so many photo ops! Fabulous photo…great to know the stroy behind them. 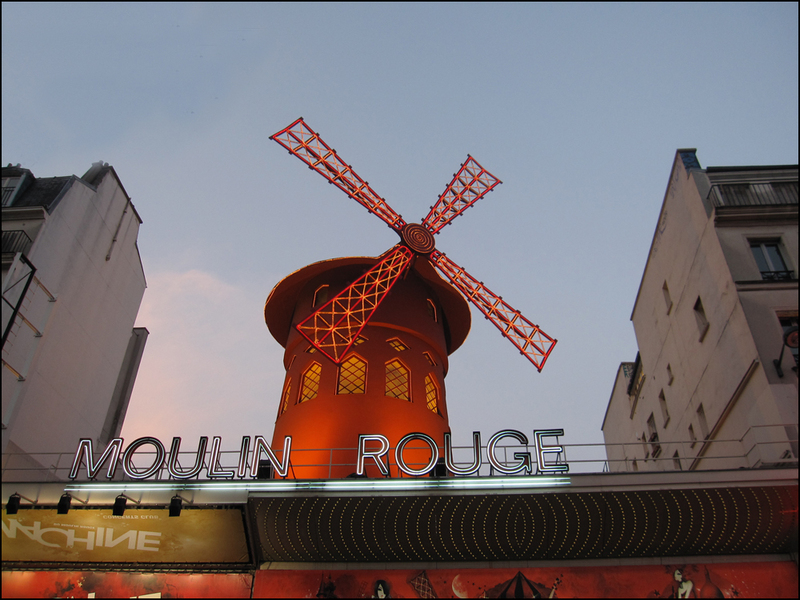 Can’t believe I didn’t make it to Moulin Rouge during my one trip to Paris! But we were backpacking and had to save money. I guess I’ll have to go back. Beautiful pictures! S’marvelous, s’wonderful . . . I love how that couple on the rooftop looks like they are looking down into a canyon of buildings . . . and you can see so clearly, so deeply down into it. Amazing photography! The colors, the tonal range . . . How could you have done such a thing? Next time you are in LA, drop in for a drink late at night. That lobby is a microcosm of interesting people. Prince was caught playing an improptu show at 2 am…. Gorgeous, we love the idea of Paris from an insiders point of view, and your photos are amazing.